We’ve already reviewed “Fast & Furious” and we’ll get to both of the Vin Diesel video games later this week, but we needed to step back and catch up with two Diesel flicks hitting Blu-Ray for the first time - one of his best movies by far and, well, a disappointment to say the least. Universal has given 1999’s “Pitch Black” and 2004’s “The Chronicles of Riddick” their spectacular Blu-Ray treatment, complete with 1080P pictures, DTS-HD Master Audio tracks, excellent special features, and their super-cool “U-Control” functionality that allows behind-the-scenes details to be broadcast picture-in-picture as the movie plays. 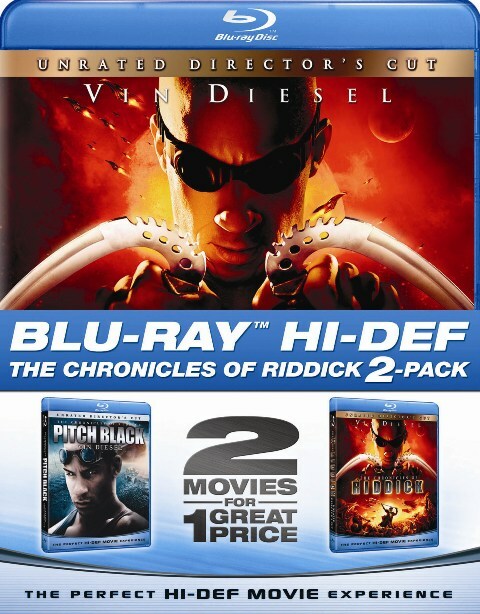 Pitch Black and The Chronicles of Riddick were released on Blu-Ray on March 31st, 2009. I’ll be blunt - “Pitch Black” rules. I think it’s Diesel’s most confident interesting performance and David Twohy expertly directs this sci-fi/action thriller. It’s just a thrill ride and if you haven’t seen it then you should do so as quickly as possible and anyone who has seen it and loves it has a new Blu-Ray release to add to their collection. Five years later, Twohy and Diesel brought Riddick back in an ambitious and elaborate film that its creator hoped would expand the franchise and mythology of this character but it actually did the opposite. “The Chronicles of Riddick” is a great example of bloated, confused filmmaking, the exact opposite of “Pitch Black”. Fans of the character and actor may want to include it in their collection, but most people don’t need to waste their time. Both films are available unrated or rated on the same Blu-Ray discs. The unrated version of “Pitch Black” runs three minutes longer than the theatrical. The unrated version of “The Chronicles of Riddick” runs fourteen minutes longer than the theatrical. “Pitch Black” includes “An Introduction by David Twohy,” “The Game is On,” “Johns’ Chase Log,” “The Making of Pitch Black,” “Dark Fury: Advancing the Arc,” “The Chronicles of Riddick Visual Encyclopedia,” “A View in the Dark,” feature commentaries with cast and crew, and the wicked-cool “Pitch Black Raw,” a “U-Control” feature that allows viewers to see side-by-side comparisons of the special effects from raw CGI to finished sequences, and raw dailies to final scenes. “The Chronicles of Riddick” includes “An Introduction by David Twohy,” deleted scenes with commentary by David Twohy, “Virtual Guide to The Chronicles of Riddick,” “Toombs’ Chase Log,” “Visual Effects Revealed,” “Creation of New Mecca,” “Riddick Rises,” “Keep What You Kill,” a feature commentary by writer/director David Twohy and actors Karl Urban and Alexa Davalos, “Anatomy of a Fight” (available through “U-Control”), and the “Complete Chronicles,” another “U-Control” featuretette that details the history and mythology of the character picture-in-picture. Both of these Blu-Ray releases give Riddick fans everything they could possibly ask for and more. The only thing holding them back from perfect scores is the weakness of the second film. Everything else is fantastic. ‘Pitch Black’ is released by Universal Home Entertainment and stars Vin Diesel, Radha Mitchell, Cole Hauser, and Keith David. It was written by Jim & Ken Wheat and David Twohy and directed by Twohy. It was released on March 31st, 2009. It is rated R and unrated. ‘The Chronicles of Riddick’ is released by Universal Home Entertainment and stars Vin Diesel, Thandie Newton, Karl Urban, Colm Feore, Linus Roache, Keith David, Alexa Davalos, and Judi Dench. It was written and directed by David Twohy. It was released on March 31st, 2009. It is rated PG-13 and unrated.